Start-up DisplayTen wants to stop educators and IT staff from having to crawl around under tables and desks to hook up monitor cabling to laptops. 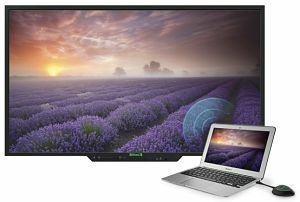 The company will be introducing a 70-inch wireless interactive display at the upcoming ISTE 2015 conference in Philadelphia later this month. The DTen allows the user to plug a dongle into a USB port-enabled device to share its screen on the display. No pre-installation of software is required. three USB 2.0 and one USB 3.0 plugs. The display is priced at $6,999 for pre-orders received by August 2015.